Thursday night, Philly brought the hurt onto the New York Giants in their divisional matchup in a beatdown that ended at 34-13. The Eagles finally looked like that championship-caliber roster that everyone knows they should be. Leave it to those now 1-5 Giants to awaken an underachieving squad on their own home turf. Zach Ertz: "I think this is finally a game where we’re finally able to say, ‘That’s us. That’s the Philadelphia Eagles.’ That’s a game where we put our stamp on the whole entire game, 60 minutes, offense, defense, special teams." As star tight end Zach Ertz said, the Eagles put together a complete game for the first time this season against New York. Going into this Week 6 matchup, Philadelphia had failed to score over 23 points in any game in the 2018 season, with the only legitimate defense they faced being that of the Minnesota Vikings, who had struggled mightily prior. Plain and simple, Philly had not been the same this entire year. Enter the New York Giants. 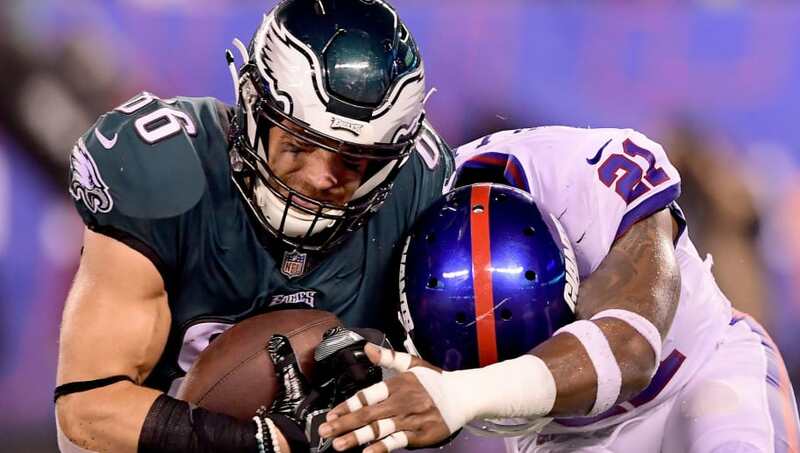 Heading into the game, an 11th ranked passing defense and 26th ranked rushing defense for New York suggested that Philadelphia may have had trouble offensively Thursday night. After all, with Jay Ajayi gone for the season, Carson Wentz and the struggling passing attack would be forced to play into a more than competent New York secondary. That, ladies and gentleman, is what a franchise quarterback looks like. But, struggle they did not. In fact, most of their offense came through the air. Wentz almost hit 280 yards with 3 touchdowns and no interceptions against that 11th ranked secondary, essentially erasing any positive aspect of the Giants' defensive game this season. The Philly rushers put up over 100 yards. The ball was spread amongst all the significant receivers. Simply put, New York let Philadelphia walk all over them, pathetically letting their rivals fearlessly attack their strengths and allowing them to succeed. New York did more than just lose the game and demoralize themselves. They may have just lit a fire underneath the Eagles that could jump start them for the rest of the season.